A parliamentary report of 1777 recorded a parish workhouse in operation in Gamlingay (for up to 12 inmates). 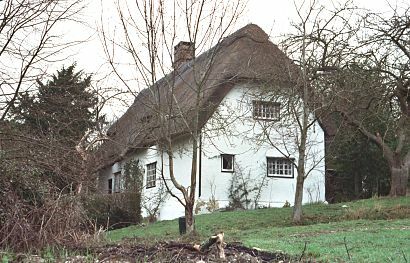 A cottage at Crow End in Bourn is said to have been used as a local workhouse in the 19th century. Bourn former parish workhouse, 2003. Cambridgeshire: Arrington, Bourn, Caldecot, Caxton, Croxton, Croydon, East Hatley, Elsworth, Eltisley, Great Eversden, Little Eversden, Gamlingay (2), Little Gransden, Hardwicke, Hatley St George, Kingston, Knapwell, Longstow, Orwell, Papworth St Everard, Papworth St Agnes, Tadlow, Toft, Wimpole. The population falling within the union at the 1831 census had been 8,946 with parishes ranging in size from Hardwicke (population 90) to Gamlingay (1,319). The average annual poor-rate expenditure for the period 1832-35 had been £6,384 or 14s.3d. per head. The new workhouse was built in 1836-7 at a site on the eastern side of what is the now A14 road at the northern end of Caxton village. The architect was William T Nash and his design was similar to that of the St Ives workhouse for which he was also responsible. Its construction cost around £5,400. Its design was a single quadrangle divided into four segments by partition walls radiating from a projecting bay at the rear of the front block. Its layout be seen on the 1902 25-inch OS map which shows its proximity to the local police-station and the local inn. Further up the road to the north stood Caxton Gibbet. The union was briefly involved in anti-poor-law activities. The Revd FH Maberley, vicar of Kingston, condemned the evils of the workhouse and the cessation of outdoor relief. In a pamphlet entitled To the Poor and their Friends... he claimed that the 1834 Act was "tyrannical, unconstitutional, anti-scriptural, anti-Christian, unnatural, cruel and impolitic in the extreme." He also claimed it encouraged homosexuality (by segregating the sexes) and promiscuity (by changing the bastardy laws to the advantage of fathers). In a series of public meetings in 1836 and 1837, while a number of local workhouses were under construction, Maberley campaigned vigorously. He even attempted to break into Caxton workhouse to rescue a pauper whom he believed was there unjustly. However, his efforts were unsuccessful and support for his campaign gradually dwindled away. 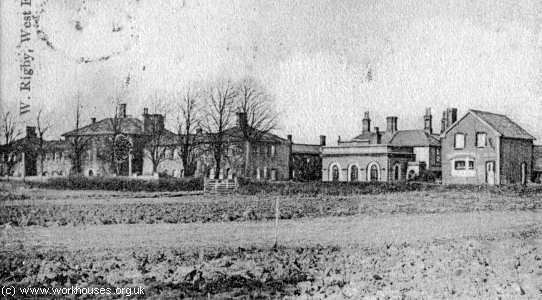 Caxton union workhouse (left) from the south-west, c.1910. After 1930, the workhouse became a Public Assistance Institution. The building has now been demolished. Cambridge Archives and Local Studies, Box SH 1009, Shire Hall, Castle Hill, Cambridge CB3 0AP. . The surviving records include: Guardians' minute books (1847-9, 1889-91,1894-1930); Births register (1838-47, 1866-1928); Deaths (1914-30); etc. In and Out of the Workhouse: the Coming of the New Poor Law to Cambridgeshire (WEA, 1978).